It's that reputation for "vice" that is often top of mind when people think of Amsterdam, which for a long time served as a mecca for backpackers using Frommer's "Europe on $10 Dollars a Day" hoping to enjoy the benefits of the city's liberal prostitution and drug laws. Amsterdam has been working to expand it's appeal beyond a place to host a bachelor party, and it's working! When my husband invited me to "Pick any city in Europe, I'll meet you there for the weekend" during a long European business trip, Amsterdam came to mind right away, but Amsterdam was my first choice, because the early May weekend coincided with peak tulip season in the Netherlands! While vice is still possible in Amsterdam (see my Vice Advice below) Amsterdam is a superb place to visit because of it's world class museums, scenic canals, as well as it's reputation for fun. We decided to stay in an apartment in Amsterdam with Home Away. 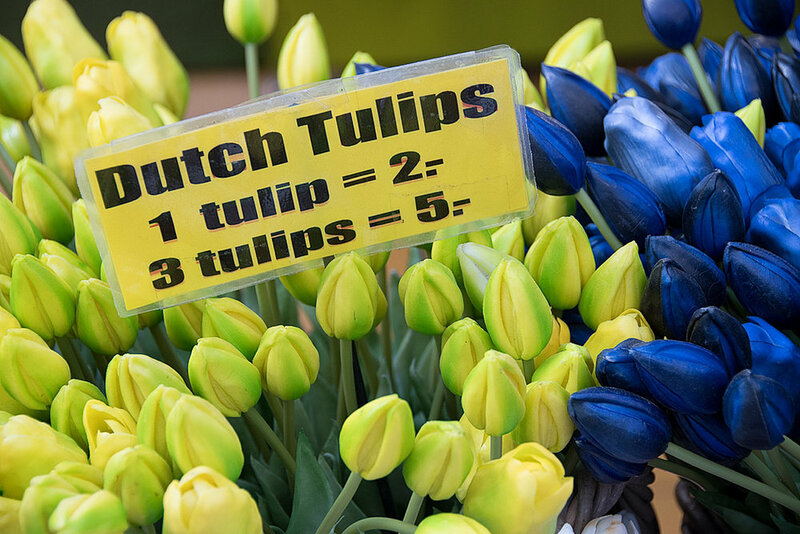 During peak tulip touring season, many of the hotels in central Amsterdam were 350 euro or more per night. We were able to get a studio apartment for about 60 percent of the cost of a hotel room, which allowed us to prepare meals in our accommodation and live near enough to attractions that we walked everywhere! We also got the added benefit of an on site owner who helped steer us to the best restaurants, and least touristy, in town! We stayed at Studio King and Queen in the Southern canal area, which was within easy walking distance of both the museum area and the Dame Square sites. Our host was Charlotte, who not only welcomed us personally, but she also baked us a loaf of fresh, warm bread and stocked the refrigerator with coffee, tea and honey and butter. It was so nice after a long flight to have a slab of homemade bread with local honey and nap! A stay at Studio King and Queen is like staying with a friend in the city, the owner, Charlotte, who lives upstairs, left us a book with all her recommendations for shopping, dining and all the major attractions noted on a large map. We used many of her recommendations and never had a misstep! She spent the weekend at her summer home, but was available to us by cell phone for any issues that might have come up, and she emailed us mid stay to remind us that May 5th is the celebration of Liberation Day in the Netherlands, and she enthusiastically shared directions about where to go nearby see the annual concert and the appearance by the King on the Amstel River! For a hotel in the same area, look into Mercure Amsterdam Center Canal District. But I'm sure it won't come with Charlotte! Several of Amsterdam's best museums are clustered around a large park called the Musuemplein, and is home to the popular IAMSTERDAM sign popular with the selfie stick toting crowd! Be sure to get your tickets ahead of time, like most major European museums, the line is always shorter for people who have pre purchased their tickets. 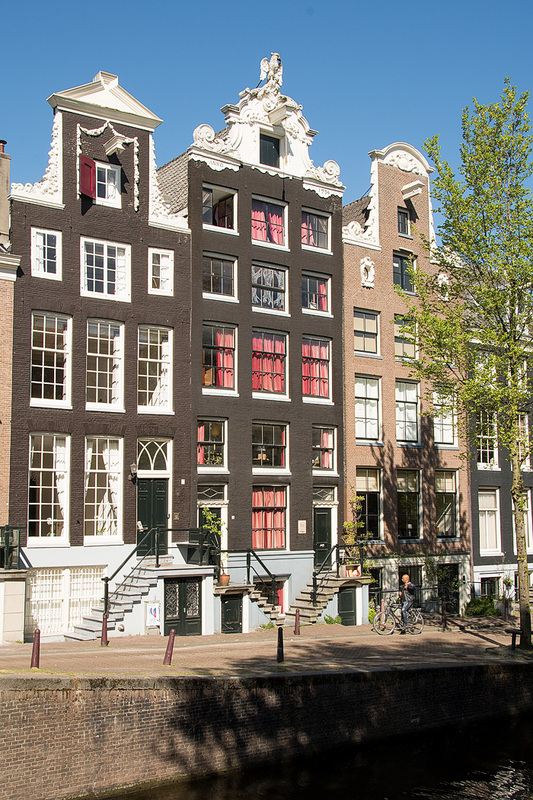 You can also arrange to get an Amsterdam City Pass which includes discounts on several major sites and museums. Be sure to check that the sights and activities you want are included on the card you buy! Also consider that Amsterdam is a very easy and small city to get around, much of it can be explored on foot. So you may not use the transportation portions of the pass for touring in a small city like Amsterdam, and the bus to the museums from the airport was only 5 Euro at the time we traveled. Click on the photo below for a just a minute in the life of the IAMSTERDAM sign! We made the choice to hire a professional guide through Context Travel. 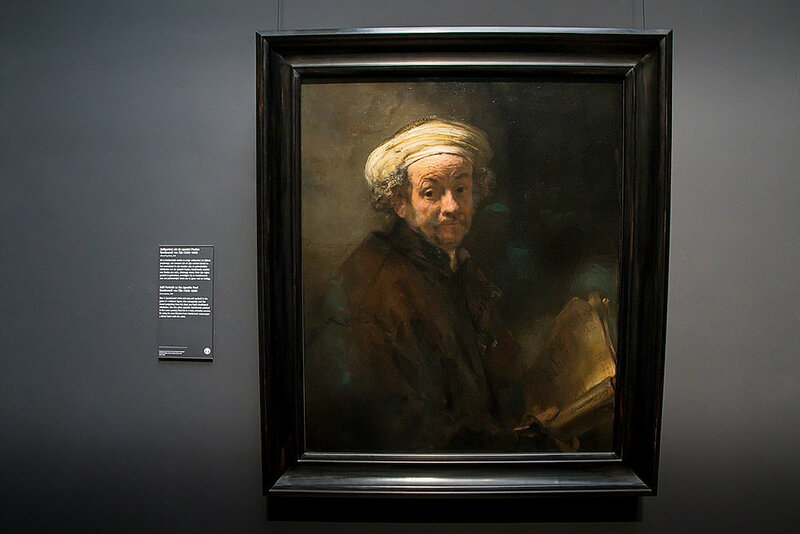 Our Context guide arranged to get our tickets; a visitor touring independently will want to be sure to arrange to buy tickets online ahead of time at the Rijksmuseum site. We discovered Context tours when I was in London and Paris (see our London and Paris reports here) and we found them to be the highlight of our visit to both cities. In each city, experts in art, history and culture are paired with small groups for small group guided tours (or choose to go private by buying a minimum number of spots) Our tour was 4 people and our expert guide, Sabry Amroussi. With Sabry's guidance and enthusiasm, we explored the Rikjsmuseum, recently renovated and curated in a more accessible way for visitors. The front of the museum, which features a road running under it for bicycles, pedestrians should stay to the right or left for safety! The Museum was originally designed to look like a church to rival those in other European cities, despite always having been a secular building.. That includes this dramatic stained glass window, that memorializes secular historical figures in art, architecture and commerce. The new design of the museum places all the "block busters" in the "nave" of the museum, called the Gallery of Honor. This large room designed to look like a cathedral with side chapels, holds most of the important Rembrandt paintings, with Rembrandt's Night Watch in the "altar" piece position. 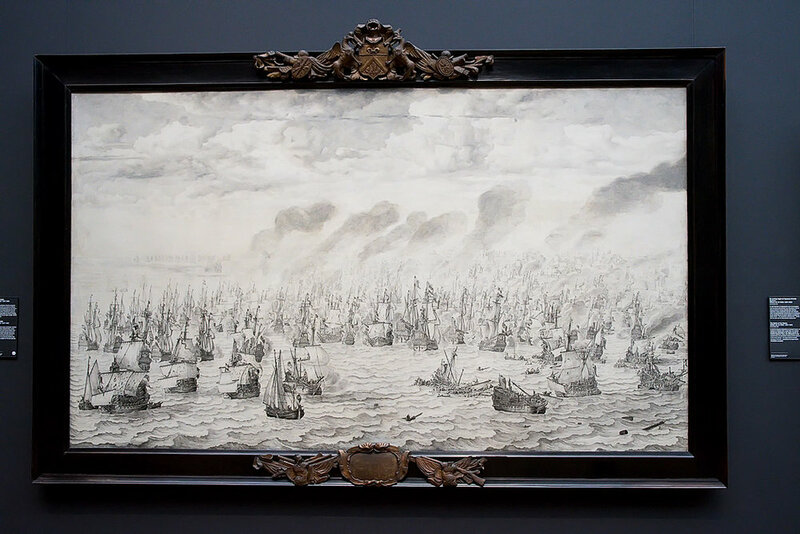 There are also paintings by Veermer, Steen, Hals and Swan and other famous dutch painters. The advantage to this floor plan, is it leaves the rest of the museum refreshingly free of the swarms of tourists interested in just seeing (or taking a selfie with) the most famous works. Our guide, Sabry, took us to the balcony overlooking a Harry Potter-esque research library, where he explained that as an art historian, he is able to go and request materials and documents to examine during his research. The museum recently reorganized the works by periods, or interests, as opposed to paintings in one room, sculptures in another, decorative arts in yet another location. Instead, Rikjsmuseum organizes things in a way that more cohesively tells guests the story of the golden age of Amsterdam. 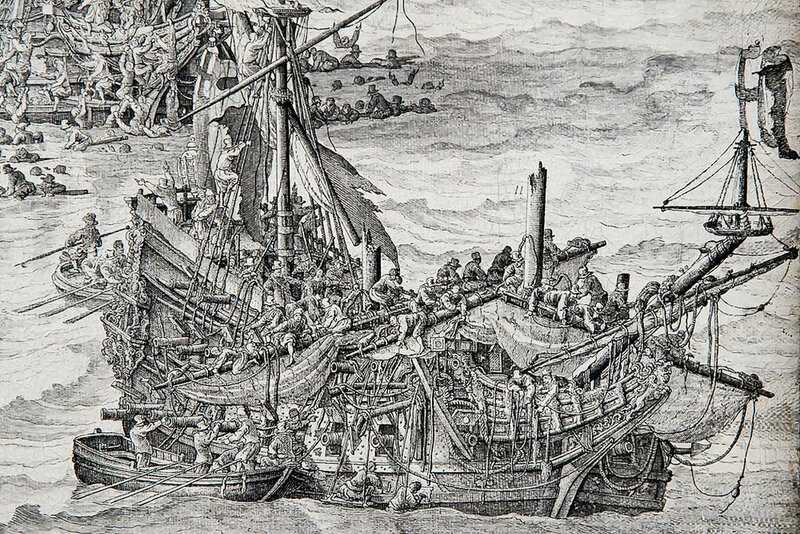 As seen in the photos below This gallery contains all of the nautical art work from the Golden Age; model ships, pen and inks drawn by commissioned naval artists and decorative pieces from the ships merchant and naval ships themselves. Also, this museum is not a behemoth like some major European museums and can be explored in a morning or afternoon, without leaving one feeling dazed. If you start feeling overwhelmed, take a break in the beautiful free public gardens that surround the museum! 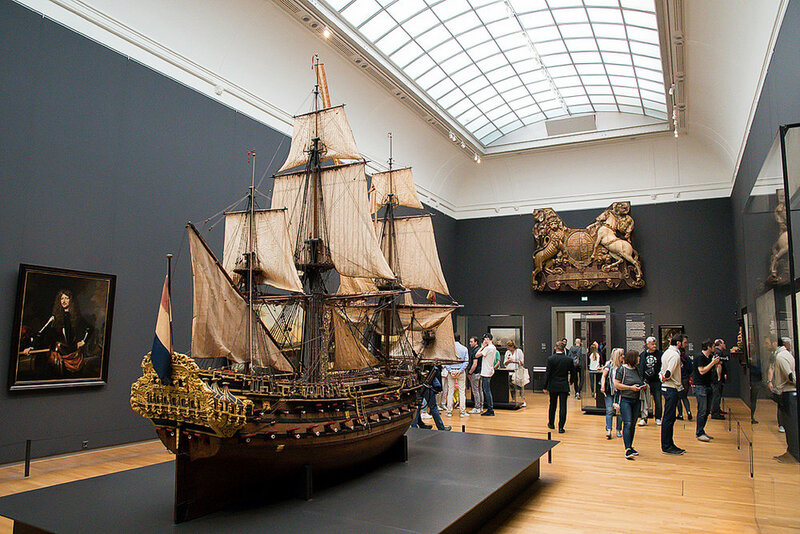 This is a much more approachable way for guests to experience the art and learn more about the Netherlands. The Van Gogh Museum is also located on the Museumplein, pre purchasing tickets is recommended. This museum is more narrow in focus, following a timeline of Vincent Van Goghs's troubled life from youth to his unfortunate suicide. But his sunny, bright colored art work left me in a happy mood in a museum where the sunlight fills the glass guest services atrium. 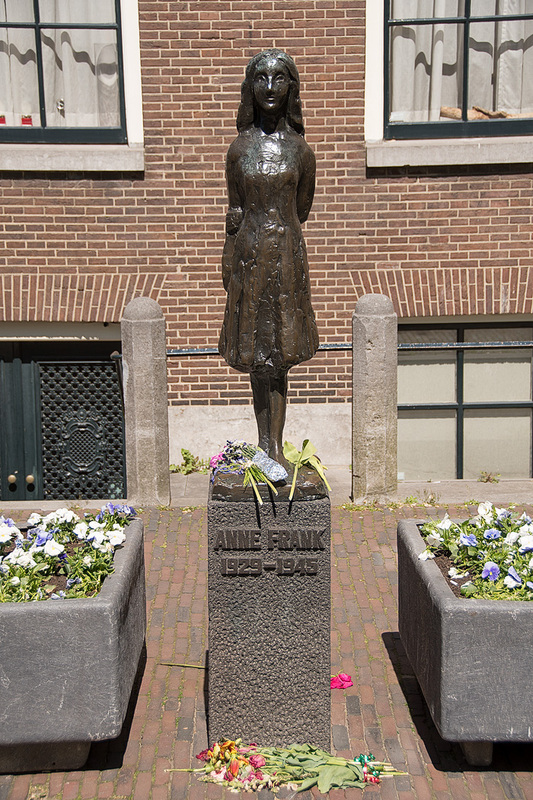 During our very short, last minute stay, we were unable to get tickets to tour the Anne Frank House. 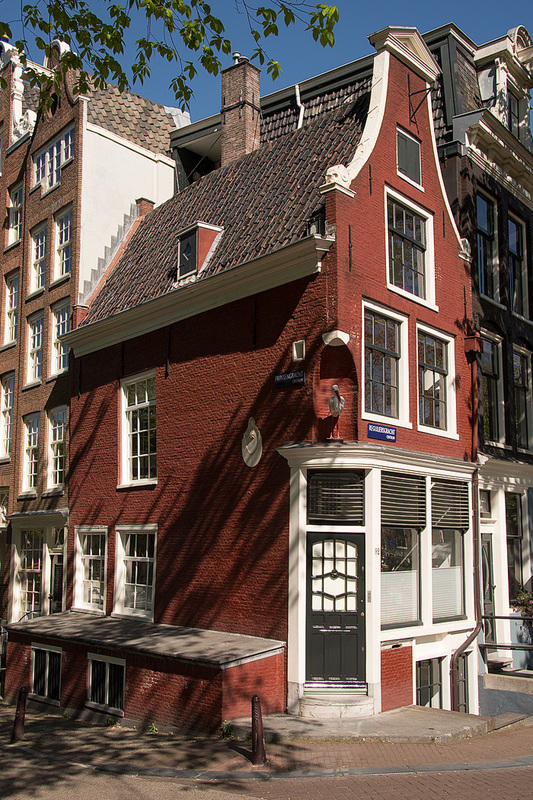 This sober tour of the tiny apartments where teen diarist Ann Frank's Jewish family was hidden during Nazi Occupation is very popular and at this time, admission is only by online advance ticketing. Tickets become available 2 months in advance of the date you wish to visit. Usually, you will be held in a waiting queue online before you can even access the calendar. You'll see a high number waiting ahead of you, but don't panic because it moves quickly when folks realize their time and dates are sold out and they leave the site. You'll need to select your date and time, number of tickets and be prepared to pay for your tickets in the cart immediately, or lose your place. Understandably, such a popular and tiny place can only accommodate a small number of visitors at a time. 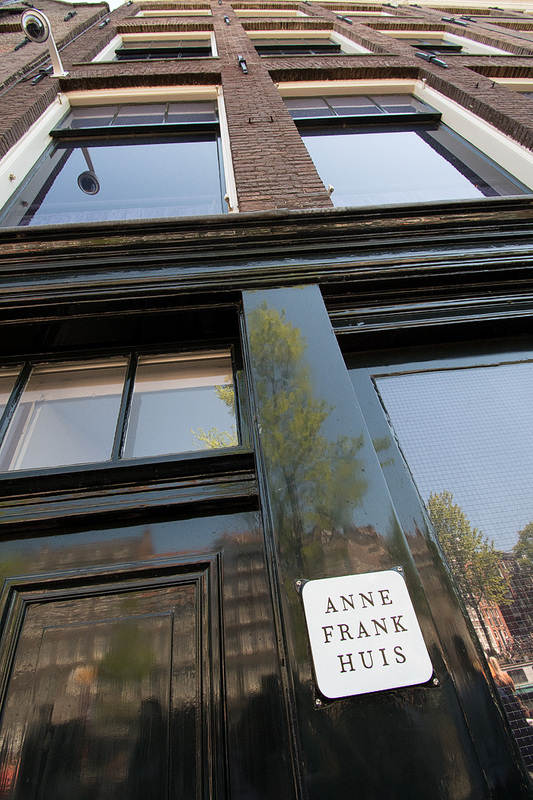 Instead of feeling discouraged if you aren't able to obtain tickets, go experience any of these other sights that seek to educate about Judaism or memorialize Jews who were murdered during the period of Nazi occupation; The Jewish Historical Museum, the traditional Jewish Quarter, the small Anne Frank statue at Prinsengracht 281 near the Westerkerk. We were also told by our context guide, Sabry (who is also an expert in Jewish tourism in Amsterdam) that the Portuguese Synagogue in the Old Side is one of the most beautiful 17th century wooden buildings in Amsterdam. You can easily explore the touristy area from Dam Square to the Central Station (or reverse) on foot. It's worth downloading Rick Steves' audio guide of the area to get the inside scoop on the architecture and history you might be inclined to walk right by if it wasn't pointed out to you! 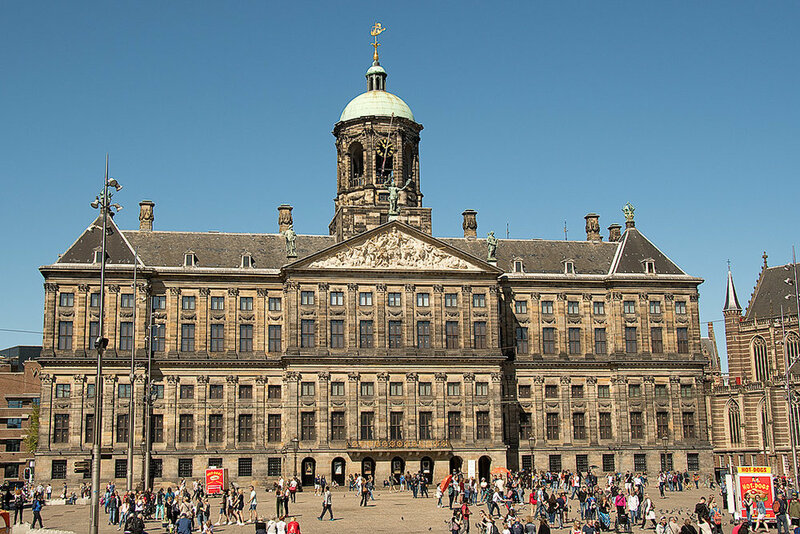 You can arrange a tour of the Royal Palace (Amsterdam still has a King as Head of State) The New Church across the Dam Square is hardly new, dating to the 15th century, and is worth looking in. 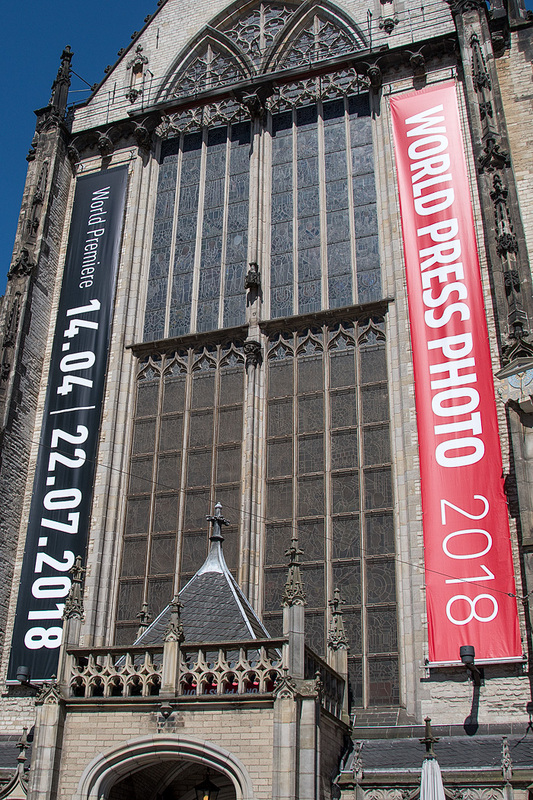 At the time we visitied, it was hosting a World Press photography exibit of great interest to us! Central Station, the main transportation hub in the city of Amsterdam. 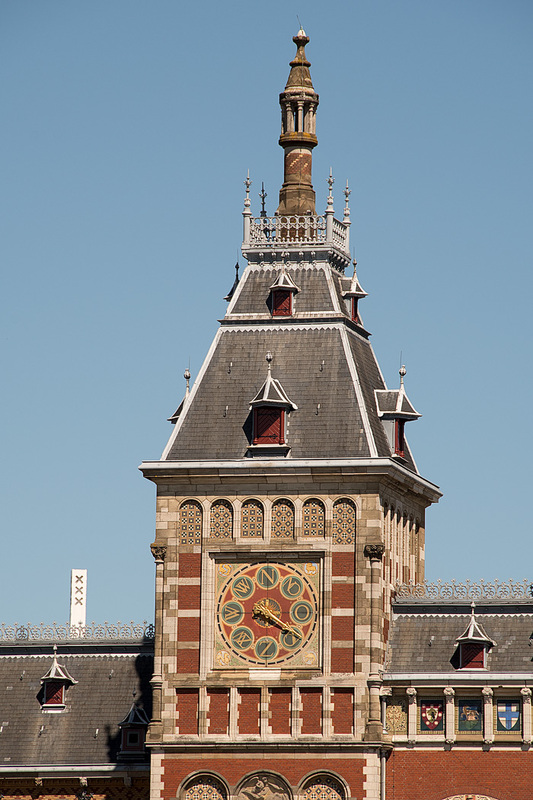 One of two towers on the Central Station, this one shows the wind direction, an important parameter for ships sailing into Amsterdam. 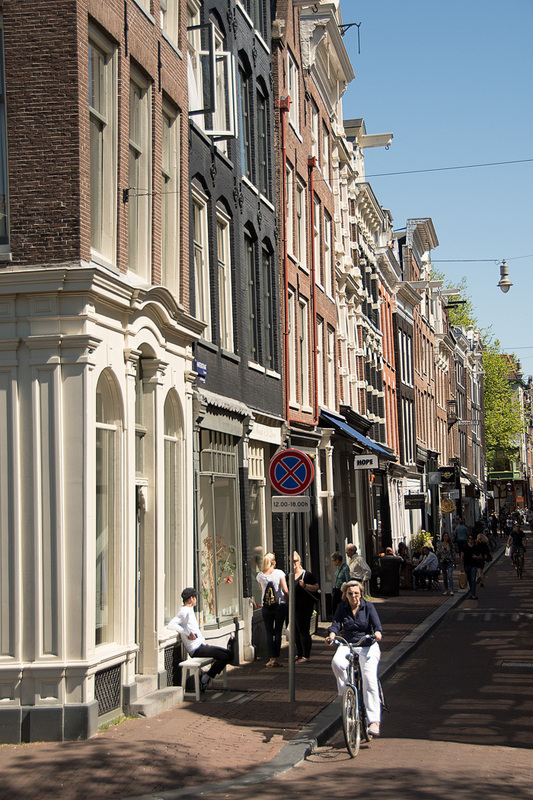 The area around the Amsterdam Museum and the main road of Kalverstraat is where the canals are wide and the streets are multiple lanes, and Amsterdam looks more like a big city than anywhere else. Spui Square is a leafy, pleasant place to explore or relax at a cafe. 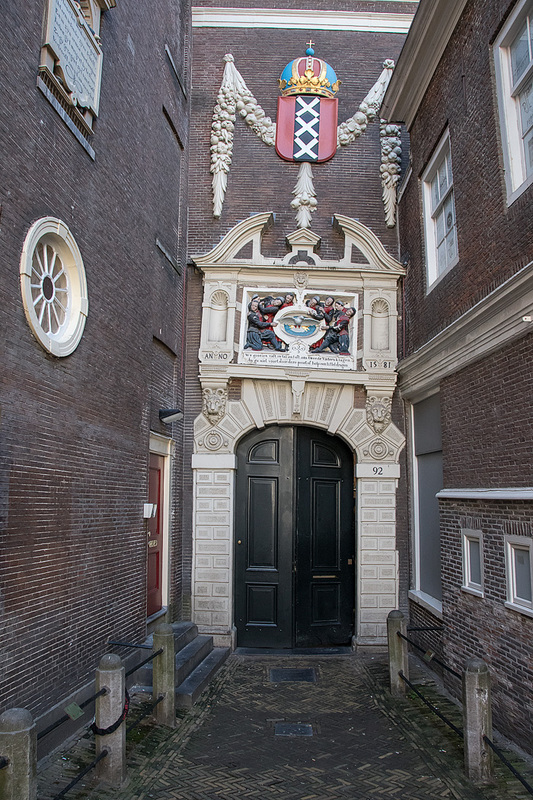 We tried twice to find the entrance to the Begijnhof, a cloistered neighborhood where the Beguine nuns once lived. We had an interest in this because our daughter did a research project on the Beguine woman's movement (they were quite progressive!) and we wanted to see this lovely area recommended by Charlotte. Unfortunately, we never did find the entry door to peek into this quiet residential courtyard! 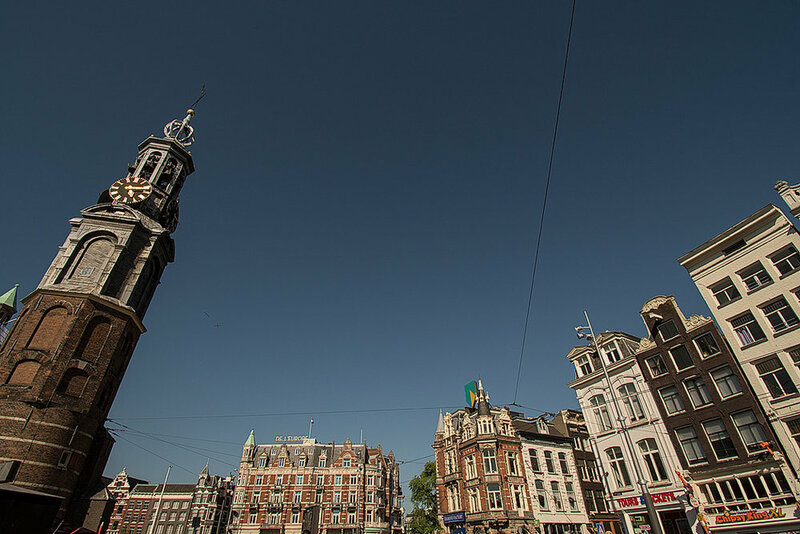 A little further south, we explored Rembrandt Square, The Flower Market and the Mint Tower. Rembrandt, in his square...our guide Sabry, explained that after Belgium left the Netherlands, the Dutch lost their claim to Rubens and actively promoted Rembrandt as the "Dutch" artist, during a time in the late 19th when the major European capitals were all promoting their civic pride! We found the Flower Market disappointing. Despite being peak tulip season, the market appeared to feature mostly cheap tourist souvenirs and very few live flowers (tourists rarely have use for live flowers!) There were lots of colorful plastic flower displays for taking photos and bulbs packaged to travel for sale. Check carefully before buying bulbs that you will be able to bring them through customs in your home country. The Mint Tower is popular as one of the oldest clock towers in the city, but not just with historians...built in year 1620, which is Euro time that translates to the afternoon time of 4:20 PM, it's also popular place for cannibis tourists to take selfies at...wait for it 4:20 PM! The Prinsengracht canal is reflected on the building that housed Anne Frank and her family during Nazi occupation. Along the Keizersgracht Canal, a modern monument to homosexuals who lost their lives during WWII is made of a pink granite triangle. The Leidseplein is a popular but busy square with lots of outdoor cafes. Tourists from all over the world gather here, and the trams run up and down Leidertraat. Southern Canal district, with atmospheric bridges and houses. During a busy holiday weekend, the canals were jammed with traffic headed out to the Amstel River to hear the concert. While it looked like chaos, it was all very good natured! Amsterdam has progressive drug and prostitution laws. Whether you want to experience this depends on your interests. Here are our experiences and what sources we used to plan whether or not and prepare for our trip. 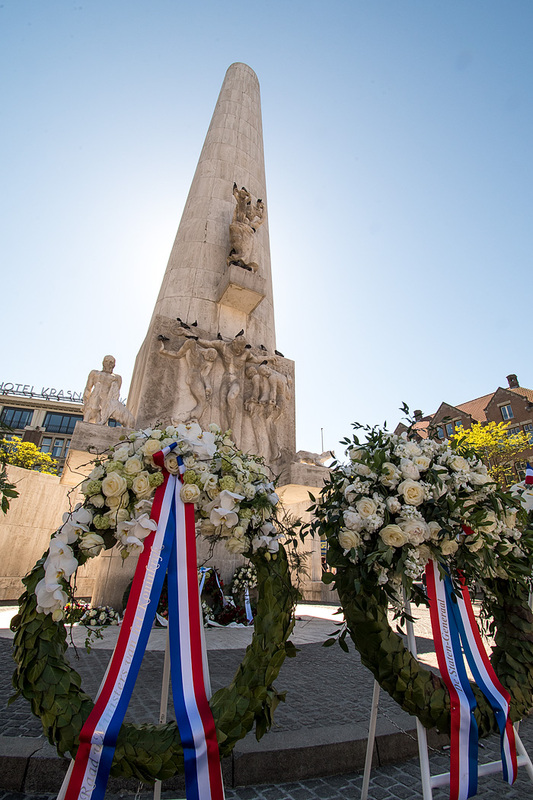 We decided we'd like to see this part of the city, which served the many merchant marines that poured into Amsterdam off of ships during it's hey day as a cross roads for trade in Northern Europe, even if we didn't "participate". Prostitution is legal and managed within buildings with small booths with large windows and red lights above the doors. Men wander through the narrow streets and can view women in the windows in their lingerie who are advertising their services. Whether these ladies are entrepreneurs or victims is always an open question. But if you'd like to visit this area, I'd recommend being respectful; we saw ladies draw their curtain if they felt groups of tourists were just "looking" or "mocking" and not "shopping". Certainly, there should be no cameras or selfies taken here! Rick Steves recommends going early in the evening when the area is still well lit at dusk, pick pockets are less active and the clientele is more sober. 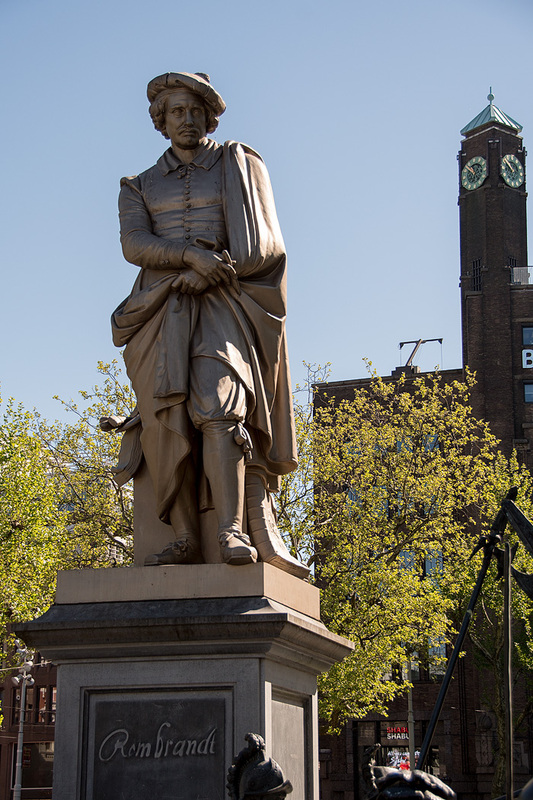 He offers a good historical walking tour, and an out..."It's perfectly ok to say 'no thank you'." And I'd agree...it's not for everyone, but it is part of the city's culture. But Amsterdam is so much more! The most popular substance we saw used was Heineken Beer! There are dozens of bars and cafes along every canal and most folks enjoyed a beer (or other cocktail) while watching the world go by! Our experience was that prices are higher on the most popular squares and that if you walk a few blocks away from the main squares, you can enjoy drinks with all the atmosphere, but a few less people and lower prices! Another popular Amsterdam activity is a Heineken Brewery tour. We didn't partake in this tour, but the lines wrapped around the building indicate it's popularity! 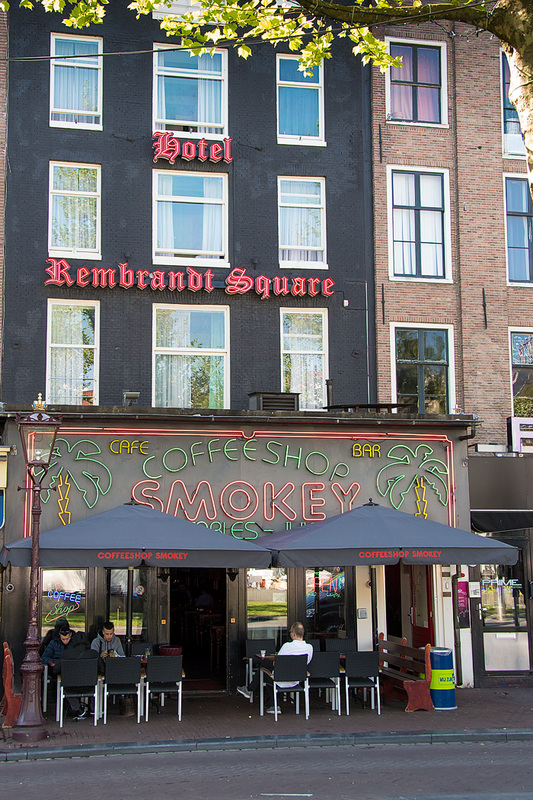 The substance everyone thinks of in Amsterdam is marijuana, which is legal when used in special "coffee shops". These are pretty easily found in most of the major squares around Amsterdam, by the wafts of smoke coming out of them, (indoor smoking is not allowed anywhere else in Amsterdam) and the special green signage. These shops sell marijuana for use at the cafe, and some also sell edibles, but because of rules, they can't sell alcohol at the same place. We stuck our heads into a couple of these cafes and most looked to us like ordinary coffee shops, except the "barista" would help customers choose cannabis, and instead of hyper caffeinated people on their laptops, there were stoners slumped in booths. We also read that there are "natural" supplement shops that can legally sell hallucinogens, so long as they are all natural products. We noticed them here and there and they looked a lot like a high end supplement or nutrition shop you'd see at your local shopping mall! Many local gift shops sell "hemp" in the form of candy bars, lollipops or other souvenirs. Despite the "leafy" packaging, the reason they are legal to sell is because they don't share the same effects as the products at the coffee shops. So don't spend money on them hoping for anything more than a sober laugh! And be careful to check the customs laws before bringing them home as gag gifts for friends! My overriding advice for any traveler thinking of using any substances anywhere in the world, is to be careful. For us, there was so much to experience in Amsterdam, that we wanted to do that clear headed and safely! Being under the influence of anything (including too many beer samples at the Heineken tour!) is the biggest risk factor for a traveler being victimized by bad actors that operate in any large city. Always be aware of the laws in the place you are visiting, and the risks you take before deciding to partake in any vice! There are certain places you can travel, where for a short time, you can be a witness to a spectacular natural event. Whether following migrating wildebeests in Africa, seeing cherry blossoms in full bloom in Washington DC, or hoping to see the tulip fields in Holland, its important to do a little research well ahead of time. Special "annual" events are usually short in duration, exact seasons can vary with weather conditions, and accommodations for visitors can fill quickly and far ahead of time. Luckily for us, a last minute trip to the Netherlands in early May (look for more on our trip Amsterdam coming here soon) allowed us to catch the last gasp of the colorful spectacle of spring bulb flowers that makes the Netherlands so popular in spring. We were able to find an apartment in Amsterdam for the weekend and book a bus tour out to Kuekenhof Gardens, about an hour outside of Amsterdam with little advance planning. Most of the tours and buses to Kuekenhof leave from an area near the Centraal Station in Amsterdam. Buses operated by Keukenhof can be booked on line, and there are also a variety of tour companies that run seasonal tours, most with guided interpretations along the hour long bus ride, and then setting guests out on their own once they arrive at Keukenhof with a return time to take the bus back to Amsterdam. 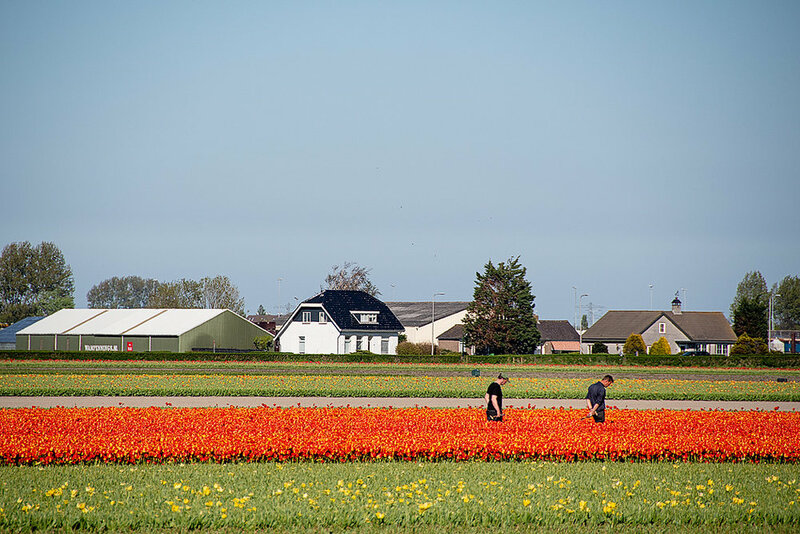 On the way out to Keukenhof, you'll pass flower fields where the bulbs are grown for harvest. Here a couple of workers inspect flowers to ensure the flower bulbs to be harvested will be perfect. Individuals with rental cars can make the easy drive to Keukenhof and park in the large parking lots, although traffic can thick during peak hours. Many people from the Netherlands use bicycles to travel the easy flat trails, and an ambitious rider willing to ride a few hours and then walk several Km around the park and bike back to Amsterdam, could make use of bicycles to get to Keukenhof, although bicycles are not allowed IN the park. The park is arranged in a roughly circular pattern, with paths fanning out from the entrance plaza and parking lots . There are several guest service areas arrayed at the edges of the park, each with restrooms, some version of dining (some are sit down cafes, some are cafeterias) gift shops, and buildings with indoor floral or educational displays. Each guest area features plenty of "selfie" or photo booth areas to take photos. 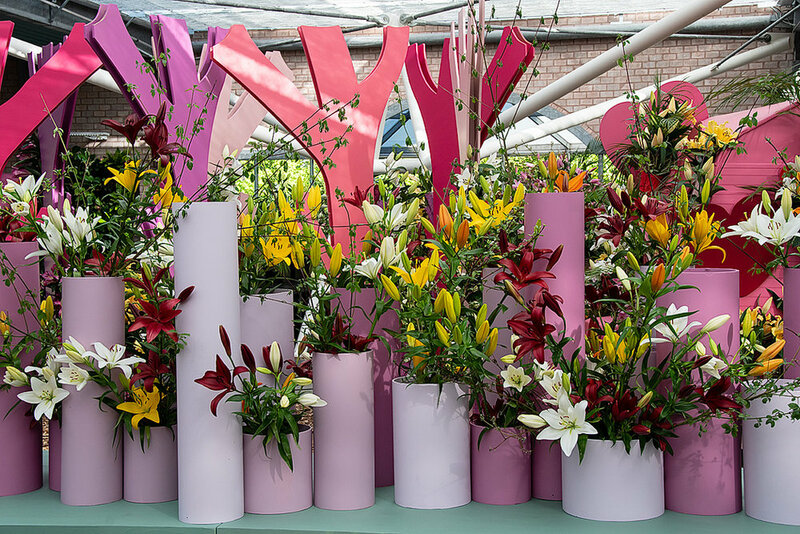 In the center are several large green houses with more expansive displays of other flowers offered by the growers and importers who present at Keukenhof Gardens. Gift shops feature typical "dutch" tourist gifts, like these clogs, as well as every imaginable household items with tulips on them! One building featured different fashion interpretations of this same floral display in all four corners. 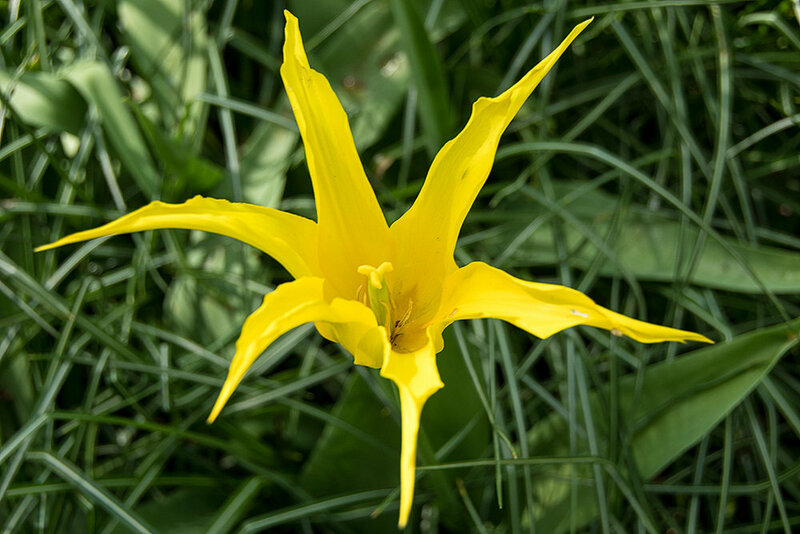 Lillies on display in the green houses. 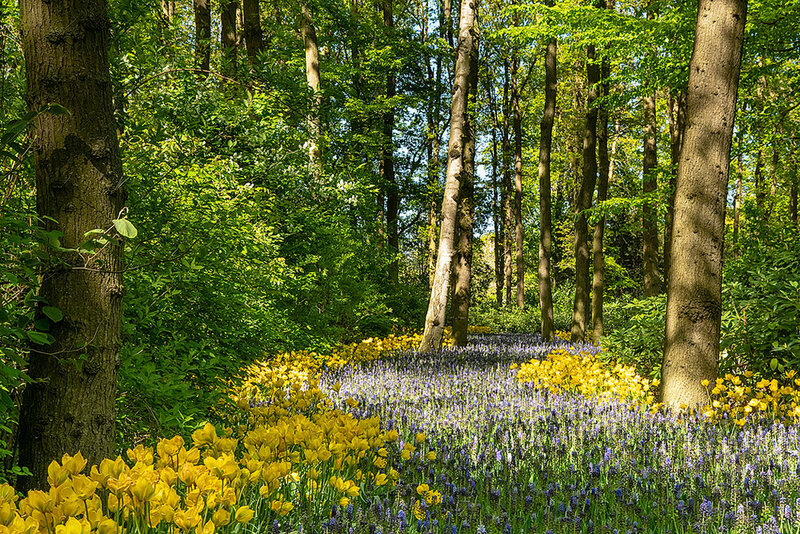 Around and between each of these areas, are dozens of curving, meandering paths, with hundreds of thousands of flowering bulbs planted in huge colorful rivers of blooms. The flowers are not only gorgeous in the aggregate, in fascinating color combinations, but they are amazingly detailed and beautiful up close as single flowers too!